Believe it or not I am finally back to fill you in on the state of Sean’s room! You may have noticed that despite my initial enthusiasm, it appears that taking on room challenges and completing them within the allotted time is not one of my strengths. 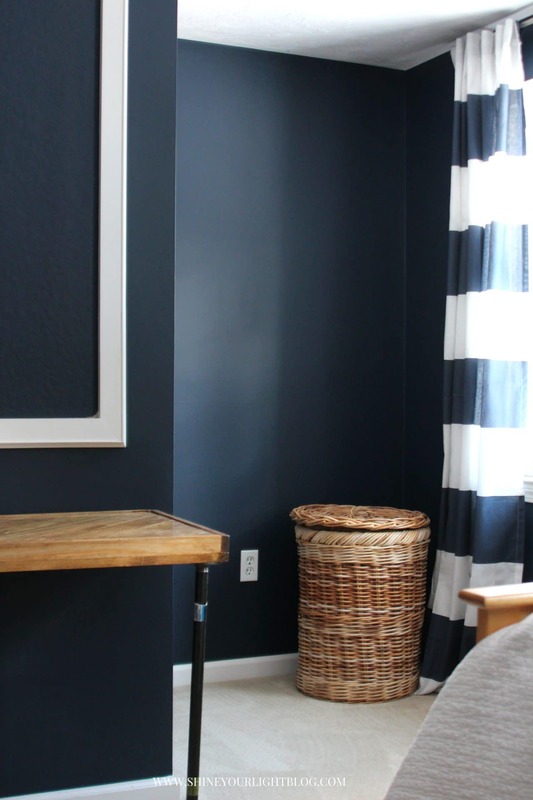 Now Sean’s room – I committed to getting it done in the month of January for Casa Watkins’ New Year New Room Challenge. Did I make it to the finish line? NOT SO MUCH. However!! I DO have a little progress with this room! And my boy is soooooo happy with one BIG addition so while I’m moving along at a snail’s pace, this room is slowly but surely getting pulled together. and the resin coated inlaid wood desktop I built. 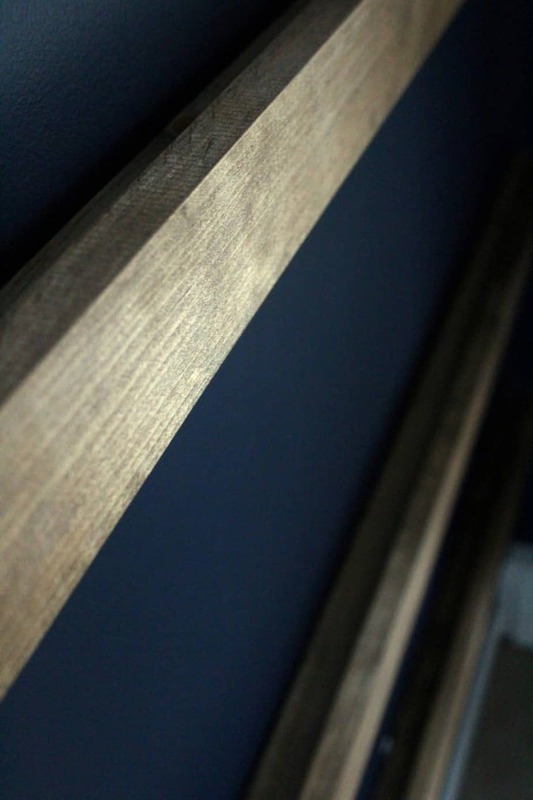 with wood picture frame ledges. 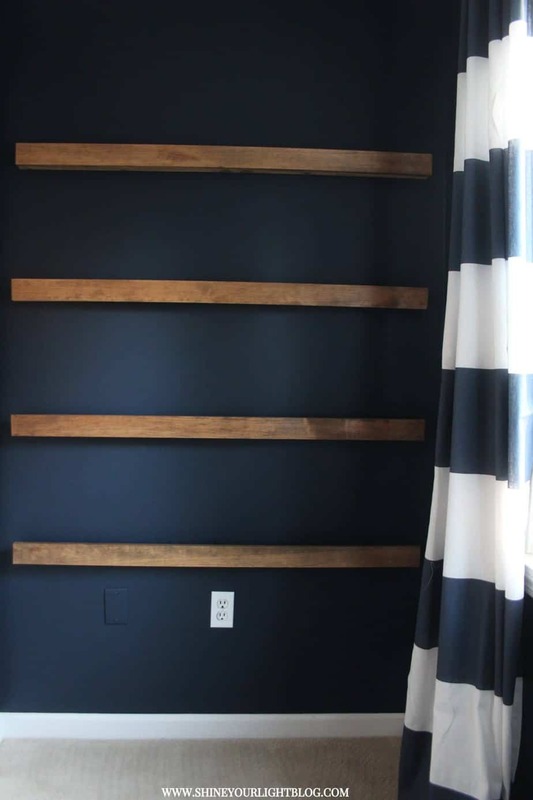 I’ve installed ledges in my other kids’ rooms too but this time I followed a tutorial by Jennifer at The Craft Patch to install a board into the studs and then attach a face board to the front that keeps the frames from slipping. 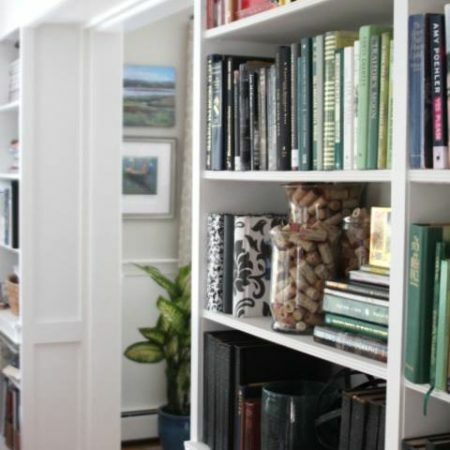 Check out the gallery wall Jennifer created with these ledges in a hallway – it looks amazing! 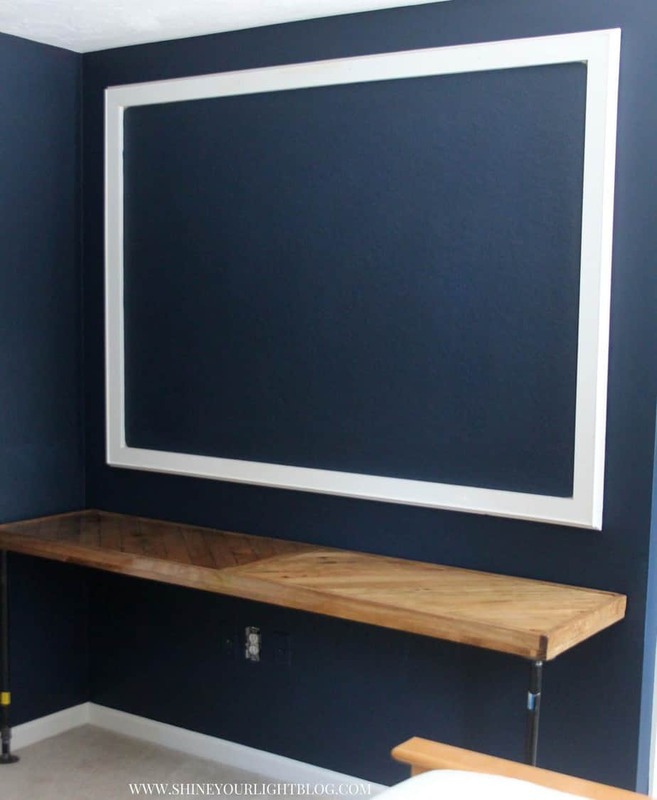 You can see Peter’s simple rustic ledges in his Moody Masculine Mighty room makeover here, and Hannah’s nail polish ledges that serve as “functional art” for a teen room here. 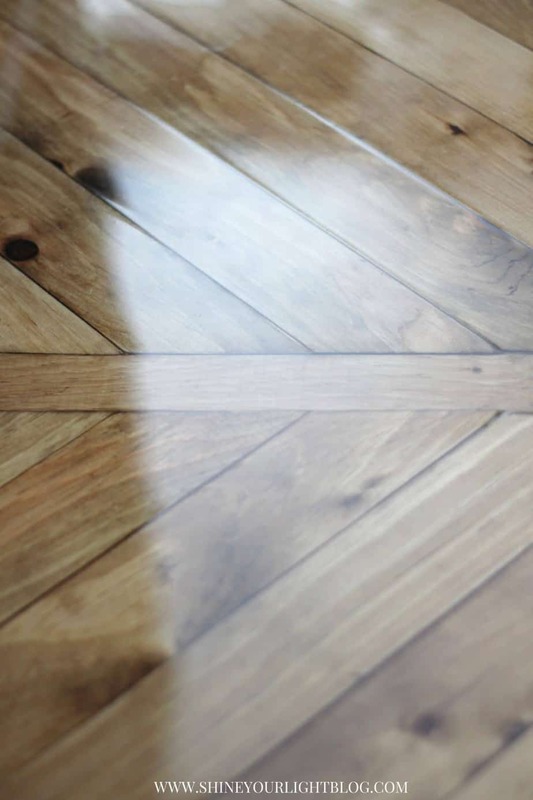 This photo below isn’t a true representation of the wood color but I wanted to show you the simple design. I love that the 1×3″ face board gives the ledges a more substantial look. To the left of the ledges is Sean’s little closet. Making this more functional was a huge priority! 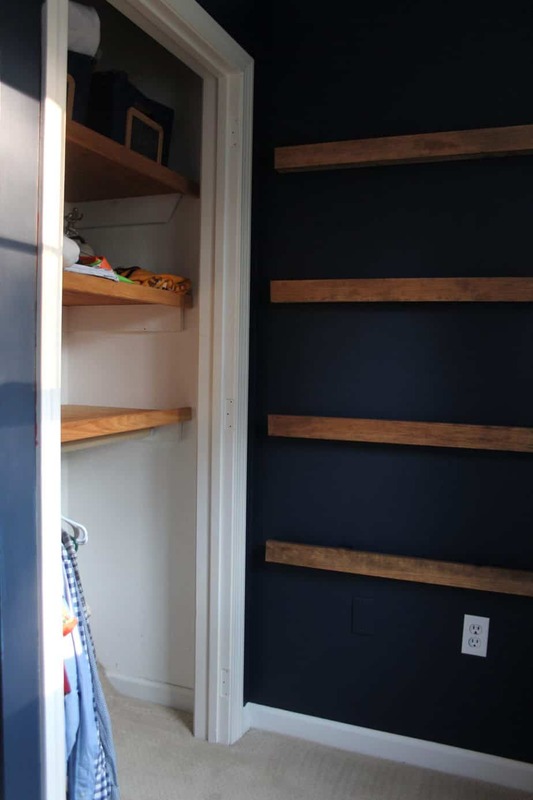 The previous owners had custom wood shelving installed in all the bedroom closets which is fantastic. However this closet had no hanging rod, no door, and the floor is sloped up because the stairwell is behind it. It was a fine closet for a little guy, but now that Seanie is almost 16, he has thick hoodies and sweatpants that don’t fit in his bureau, belts and ties and bow ties, sports apparel, and his hanging clothes like khakis and button downs. It’s amazing how kids outgrow clothes isn’t it? We had a huge closet purge and filled up 2 trash bags of clothes to donate. I took out shoes and baseball hats to be stored elsewhere and hung a closet rod, and already this space is vastly improved. The BIG BIG BIG addition to this room and surprise for my kiddo is a new queen size bed! Clearly not all zhushed up yet but my boy is so happy anyway! I’m building a headboard and bed frame that I’m super excited about and can’t wait to share with you soon, but in the meantime Sean is LOVING his big comfy bed, new sheets, down comforter and duvet!! The poor youngest child…..his life has been allllllll about hand-me-down everything – clothes, toys, sports equipment, even his old bed – even the comforter!! 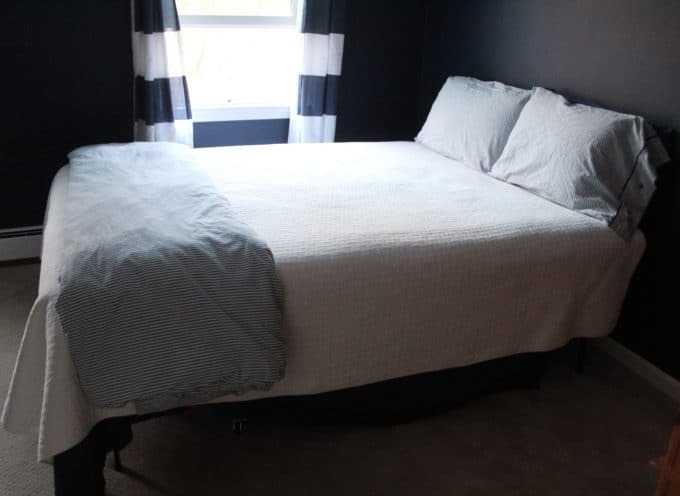 His mattress needed to be replaced anyway, and when he asked if he could get a bigger bed I immediately said no way, it won’t fit in your room, but really I started scheming immediately about how I could make that happen to surprise him! Now let’s face it – this kid has a pretty good life already – many kids even in this wealthy country are homeless and without enough food to eat. That sobering fact is not lost on me or on Sean. The fact that he is humble and appreciative makes it especially nice to be able to give him something that he considers really awesome. The room is pretty small but I removed whatever furniture I could, and specifically built the desktop super slim so that I could fit a queen in here. His brother has a queen (it used to be our guest room bed back when we had a guest room) and his sister has her huge king bed (read all about how I combined two twin mattresses to accomplish that!) and now this kid (that ADORES sleeping) has this bed of his dreams! By the way this is what it currently looks like, of course. It’s a victory for Seanie to make the school bus, forget about making the bed in the morning! It’s kind of funny how my standards about such things have dropped so radically from when my kids were small and everything would get tidied up daily. The next time this bed will be made properly is when we change the sheets or I shoot the room for the final reveal. I’ve learned to let some things go and it feels OH SO GOOD to truly NOT CARE if my kids’ beds are made as long as they help around the house like emptying the dishwasher and taking out the trash without being asked (thank you Lord for those moments when they do it without being asked!!! ), clean up after themselves in our shared living areas, are RESPECTFUL and KIND and NICE to be around, and show a little gratitude now and then. The making of the bed pales in comparison to those things!! Phew – this has turned into quite the wordy post! 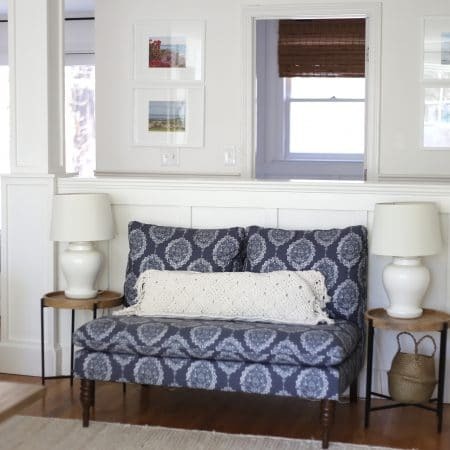 Thanks for bearing with me as I get you up to speed on the ins-and-outs of a teen room makeover in real time as opposed to the HGTV lickety split version! I’ll update you soon about the bed I’m building, under bed storage, how I’m remedying the curtain situation and what’s going on the walls! I love what you have done so far. 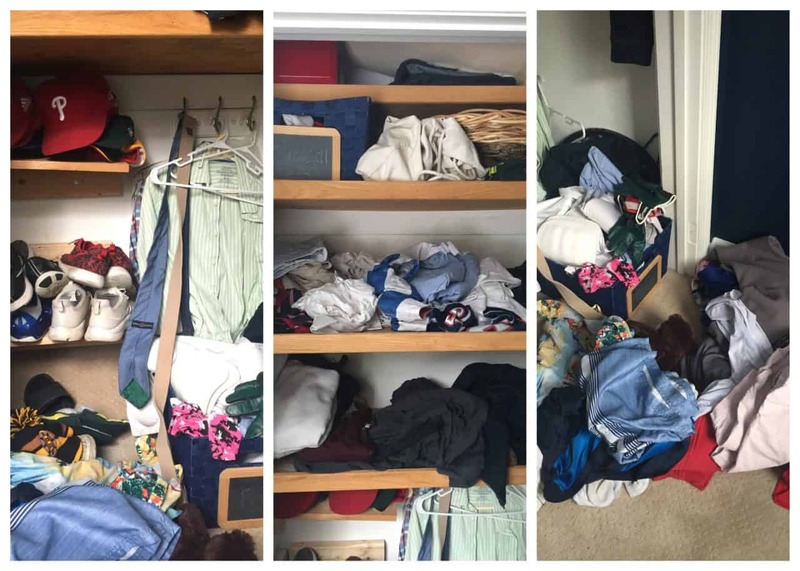 And here I thought only teenage girls closets/rooms looked like that…clothes explosion. LOL I love that you were able to surprise him with a new bed as well. 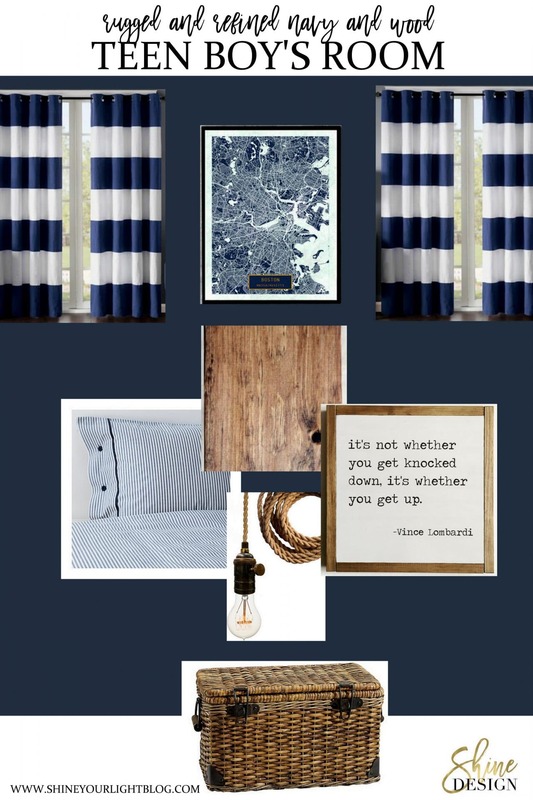 Can’t wait to see the headboard you create. Thank you Lauren! I was thinking if that room belonged to my daughter how it would be a sea of clothes!! Just LOVE, LOVE, LOVE this post!! Thank you for sharing it all!! Love your honesty and sincerity! Brenda thank you for those kind words. You are too kind! Your words ring so true about what is REALLY important in life!!! Thank you for putting it out there:) The room looks great and I’m amazed at your handy work! Your kids are blessed to have you for their mom!!! Chrissy thank you so much – you are so sweet and made a hectic, everything-is-going-wrong day so much brighter! !